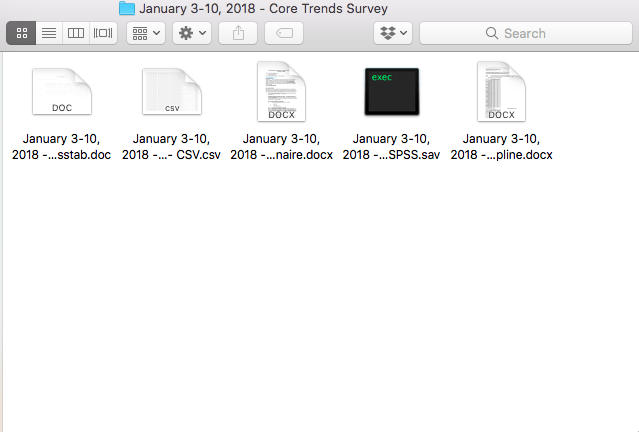 Learn how to access data from the Pew Research Center, load it into R & then how to explore the data using the Tidyverse ecosystem. That is a wide range of topics! The P.R.C releases high quality datasets pertaining to all nine areas of research. Data scientists rejoice! Go ahead and click the link to sign up for an account, and provide the necessary information to register for a Pew account. With account registration out of the way, let's download a dataset and read it into R! #what values are stored in the eminuse column? Well, the age looks like we would expect it to, but what do the values in the eminuse column represent? 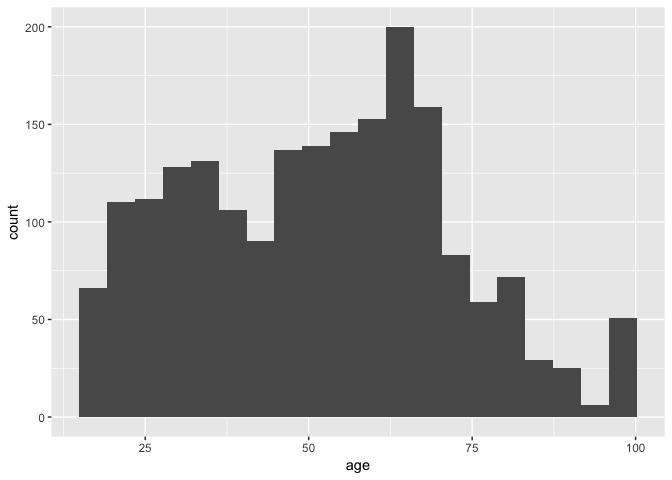 It looks like the distribution of ages in the dataset is skewed to the left. Does that makes sense when considering what the distribution of ages in the overall population is? Yes! At a given time, a higher proportion of the population is younger, which is in line with our histogram above. You may be unfamiliar with some of the syntax in this function. This is because dplyr functions use tidy evaluation. Excellent documentation for reading more about how tidy evaluation works can be found here. Interesting! Perhaps as expected, the average ages for users of all four platforms were substantially lower than their non-user counterparts. For Snapchat, the averages differ by 20 years!! #how many of the 10,000 reps are MORE extreme than the observed value? 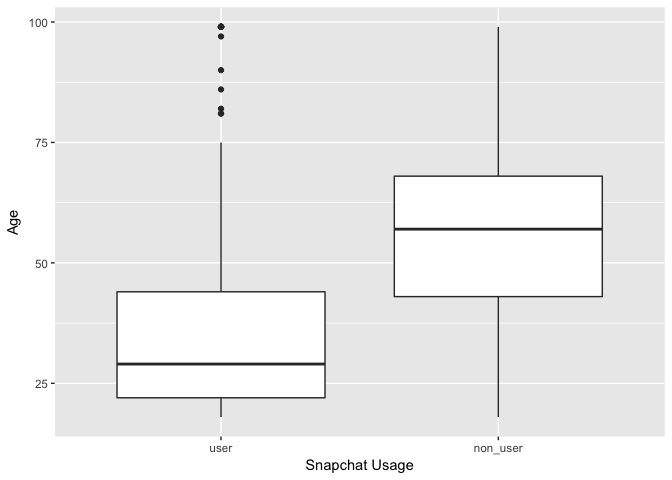 We can interpret this by saying that we are 95% confident the difference in mean ages of Snapchat users vs. non-users is between 18.3 and 22.1 years. That is an interesting find! Let's recap what we've covered. 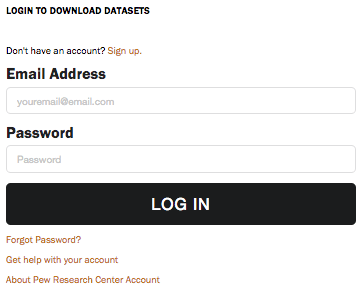 First, we gained some background information about the Pew Research Center, and how to set up a Pew account in order to download their high-quality data. Next, with the data downloaded, we took a look at how to load the data into R and explore its structure. With the data in R and an understanding of its basic structure, I showed how some simple visualizations could help to construct a hypothesis to test using the data. The question was: how does the average age differ between Snapchat users and non-users. This question was coded up using the infer package. We learned that Snapchat users are on average between 18.3 and 22.1 years younger than people who aren't on the platform! That's all for this tutorial! I hope that you enjoyed exploring data about social media usage from the Pew Research Center, and I encourage you to explore more of their awesome data and see what you can find. Happy coding! If you are interested in learning more about R, take DataCamp's Data Analysis in R, the data.table Way course.